We often wonder where the “facts” come from for some of the more misleading political commercials on TV. As today’s Washington Post story on Mitt Romney’s tax returns indicates, these so-called facts often come from journalists who confuse the difference between average income tax rates and average federal tax rates. In their article Romney Bows on Tax Rate Queries, Post reporters Philip Rucker and Rosalind S. Helderman mistakenly compare Romney’s average effective income tax rate to the average total federal tax rate paid by other Americans and, thus, give the false impression that Romney pays a lower rate than the typical American. This conclusion is wrong. The CBO data the reporters cite is for all federal taxes – not just income taxes. This measure includes everything from income taxes and payroll taxes to corporate taxes and excise taxes. To compare someone’s income tax burden to the total tax burden paid by everyone is a classic case of comparing apples and oranges. Below is the actual CBO quintile data for 2009. The income levels shown here are for a married couple. It shows that when all federal taxes are accounted for, households in the middle quintile have an average federal tax rate of 11.1 percent, well below the average rate of 17.4 percent for all quintiles. By contrast, the Top 1 Percent of households – which presumably Mr. Romney is a member of – has an average federal tax rate of nearly 29 percent. This rate is 66 percent above the average for all quintiles and 163 percent above the average for middle-income households. To perform a true apples-to-apples comparison the reporters should have used IRS data. The most recent Complete Report of Individual Tax Returns for 2010 from the IRS has a nice table on page 25 showing average tax rates by income group from 1986 to 2010. In 2010, the average income tax rate paid by all taxpayers was 11.8 percent – clearly less than the roughly 14 percent average income tax rate Romney paid last year. 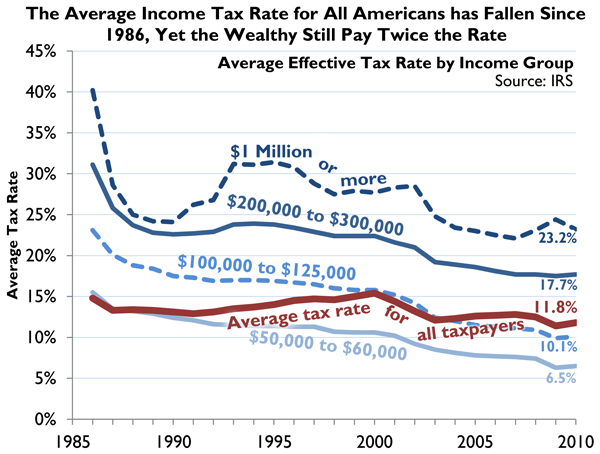 Most taxpayers earning under $100,000 pay an average rate of less than 9%. Those earning between $50,000 and $60,000 pay an average income tax rate of 6.5 percent. Admittedly, Romney’s average effective income tax rate of 14 percent is low for someone with his total earnings since the average income tax rate paid by most millionaires is 23 percent. However, since we are comparing his rate to the average rate paid by all taxpayers rather than the rate paid by the median taxpayer (49 percent of taxpayers earn under $30,000), about 96 percent of all taxpayers have a lower average tax rate than Romney. The Washington Post has committed a pretty big error, one that will likely to be misinterpreted by the majority of their readers and likely to be cited in the next PAC-sponsored attack add. By the time that the various fact check organizations correct the record it will be too late.